Many Science Museum around the World have a pair of "Whisper Dishes" where a whisper at one of the dish (which is generally parabolic) can be heard at the other distant parabolic dish. The concave shape of the dish collects the sound of whisper which is reflected towards the other dish, where it gets concentrated again and can be heard by a person standing at the other end. Best results are obtained when the speaker and listener are the foci of the two reflectors. After WW-I and prior to usage of Radar, devices based on above principle were built in several coastal region of Great Britain for early detection enemy aircrafts. Microphones placed at the foci of the reflectors would detect the sound of aircraft far out over the English Channel and give an early warning. 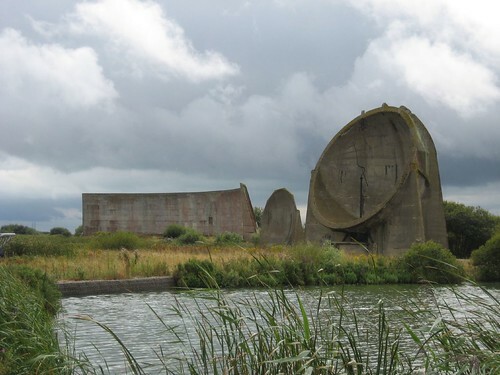 These devices were known as "Acoustic Mirrors". 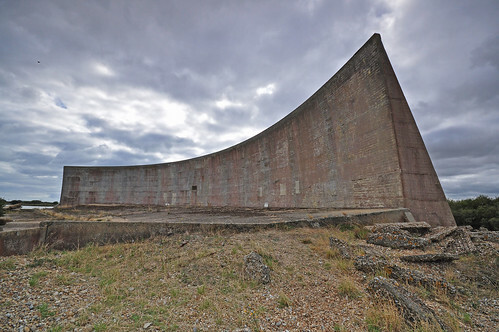 Although many such devices were built between 1920-30, but the most famous and still standing device is at Denge, a former Royal Air Force site near Dungeness, in Kent, England. As matter of fact, Denge has 3 reflectors, each of different shape. 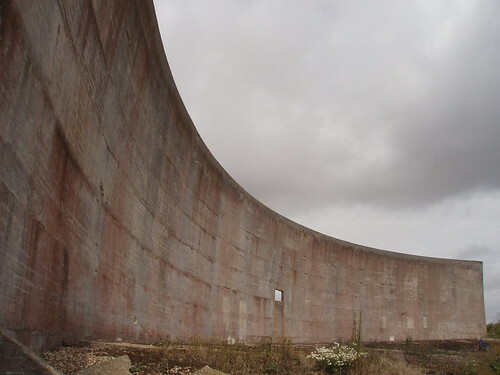 Known locally as the "listening ears" the largest one is a long, curved wall about 5 metres high by 70 metres long, while the other two are dish-shaped constructions approximately 4–5 metres in diameter. Different design indicates that devices were still in an experimental stage to find the best design to achieve maximum efficiency i.e. quickest detection. The acoustic mirror usage however didn't last long. With the increasing speed of aircraft and usage of Radar in the 1930s these soon became obsolete and most of the mirrors decayed. Here are few images of the Denge "Listening Ears"
The only listening ears built outside of the UK was at Baħar Iċ-Ċagħaq, near at Maghtab, Malta. The Maltese sound mirror locally known as il-Widna (meaning "the ear") has the same design as the large curved wall at the Denge, England.